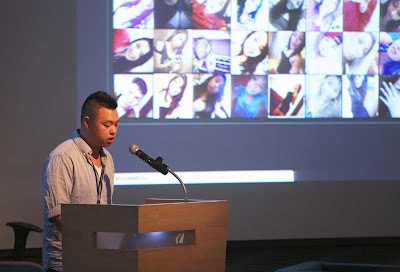 Taipei Phototime, the new work by Jay Chow and Lev Manovich premiered as part of the exhibition Wonder of Fantasy at The National Taiwan Museum of Fine Arts (NTMOFA) on May 17, 2014. 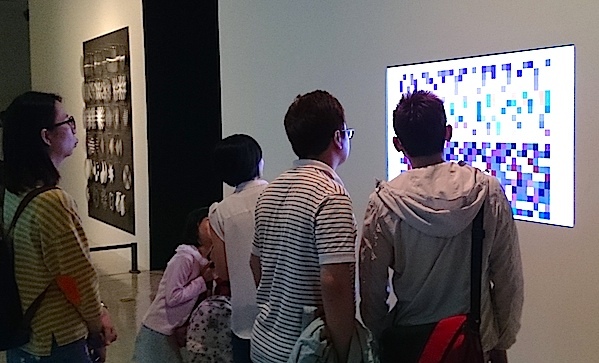 Taipei Phototime continues our investigations into expressive possibilities of big visual data. In Phototrails (2013), Nadav Hochman, Lev Manovich and Jay Chow compared 2.3 million Instagram photos from 13 global cities. 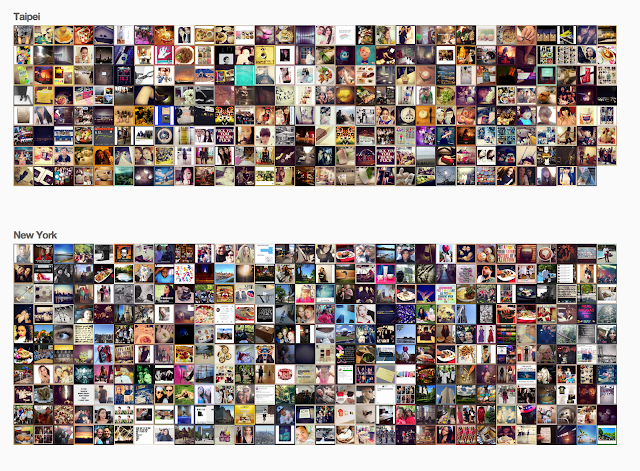 Selficity (2014), a project created by members of our lab and collaborators from New York and Germany (including visualization designer Moritz Stefaner) investigates the styles of Instagram self-portraits (selfies) in five cities. 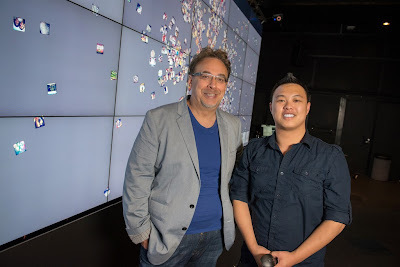 While Phototrails created "aggregate documentary" from Instagram images downloaded by the team over a few months, Taipei Phototime captures and displays new Instagram images in real time. Two streams of images, one from Taipei and one from New York, are continuously updated on the screen as users in these cities share new images. 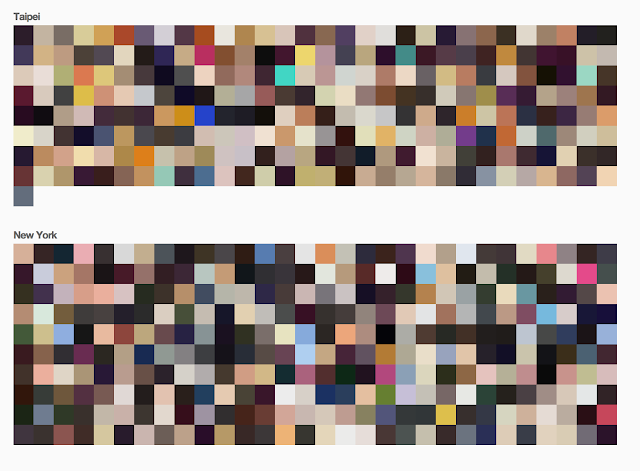 The display alternates between showing the actual photos and their abstraction - color squares representing images using their average hue. This abstracted representation allows viewers to compare temporal patterns and visual rhythms of Taiwan and New York. 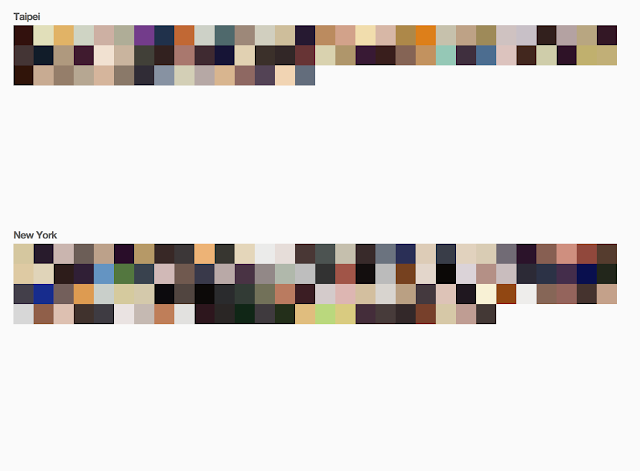 As images fill the screen, differences in color palettes, contrast, and other dimensions between the two cities become apparent. Taipei Phototime screenshots (from live stream). The representation of city life and its patterns was an important subject of modernist art. From Pissaro's Le Boulevard de Montmartre (1897) and Berlin: Symphony of a Metropolis (Walter Ruttmann, 1927) to Mondrian's Broadway Boogie-Woogie (1943), and Play Time (Jacques Tati, 1967), artists experimented with ways to show modern city's rhythms. In these and other works, a city presented as a stage for social life, or as an energizing elixir, or as a gigantic machine which subsumes people in its mechanical work. Wonder of Fantasy runs from 05/17/2014 to 08/03/2014. Our work will be running continusly during this time, displaying real-time streams of Internet images from Taipei and New York. 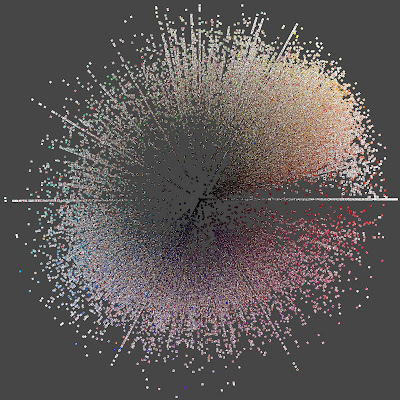 Visualization of 5,000 Instagram images shared in Taipei, part of the initial data exploration by Jay Chow for Taipei Phototime.